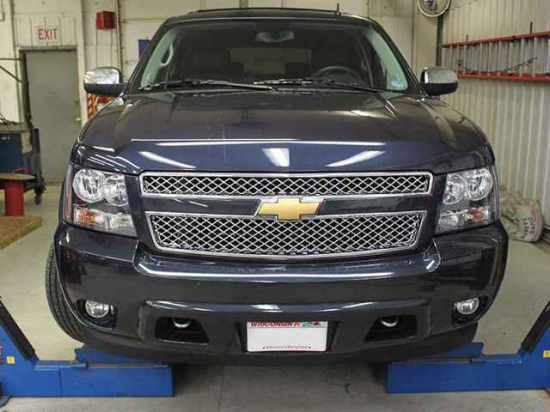 Blue Ox reliability and performance with the ability to remove the visible portion of the Base Plate when you're not towing the vehicle. So hidden you have to know what you are looking for to see it. Towed car to road car in seconds. Designed specifically for your vehicle for maximum performance and ease of installation. Includes installation instructions and installation hardware. Install it yourself and save, or have your local auto shop, body shop, or RV shop install it for you. Includes removable baseplate tabs that when removed, make the mounts virtually invisible. Designed to work with virtually any tow bar. Blue Ox base plates are designed to use existing attachment points on the vehicle undercarriage. No welding required to install these base plates! In most cases Blue Ox base plates attach through the grille. This means no dragging or scraping on the ground! All Blue Ox baseplates come with a 3 year warranty! Every Blue OX base plate is designed with your safety in mind. Each towbar base plate is then "real-world" tested to validate their safety and durability. Blue Ox tow bar base plates are custom made for specific vehicles to ensure easy installation and the best possible fit. Every towbar base plate is powder coated by baking particles of pigment onto the metal surface. This creates a glossy, uniform, and durable finish that will protect your tow bar base plate for years to come. Blue Ox is always working to provide the best quality products with easy to use design They currently offer towbar brackets for over 2000 vehicle models. Note: Before installing a tow bar base plate, make sure your vehicle is capable of being towed. Verify that your towbar is rated for more than the weight of your vehicle. Always use hardware supplied in the hardware kit or existing hardware specified in the installation instructions. See the owners manual or contact your dealership. 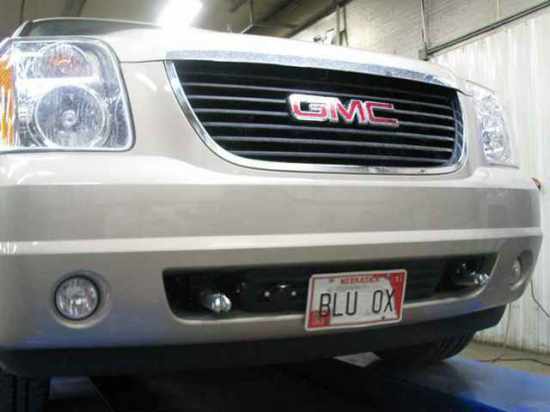 Search for Blue Ox tow bar base plates for another vehicle or browse our Blue Ox Tow Bars. --Baseplate tab width: 31 1/4"
--Baseplate tab height: 17 1/4"
--Recommended wiring: Bulb and Socket Kit" or LED Wiring Kit (Clear)" or LED Wiring Kit (Red)"
--Requires some trimming of bumper (fascia, plastic, and/or grill). --Requires some drilling (not major). --The weight of this vehicle is near the Class III, 5000 lb, rating limitations. Some models, depending on options, may well exceed this 5000 lb rating. Be sure to confirm the weight of your individual vehicle before towing. As of 1999 the Aventa II is now rated at 10000 lbs and either the Aventa II or Alexus tow bar must be used for these applications. Tow bar adapters are not to be used with vehicles weighing over 5000 lbs. --Requires some trimming of the air dam. --Tow hooks must be removed and remain off the vehicle after installation. --The optional brush guards interfere with mounting the baseplate. Part # BX3502 center section for the Samurai is compatible. Get everything you need to tow your vehicle behind your RV and save an additional 5% on the package! We have hand selected some of the top components for a complete towing kit below. If you have any questions, need help choosing, or just want to talk to an expert before buying, give us a call at (866) 305-8309. We offer the same great prices and discounts for phone orders. This baseplate is designed specifically for your vehicle and includes all installation hardware and instructions. Choose the tow bar that fits your needs and your budget. 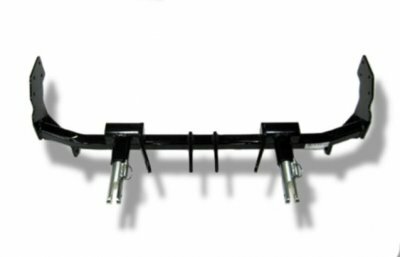 Each tow bar has unique performance features to consider beyond weight capacities. 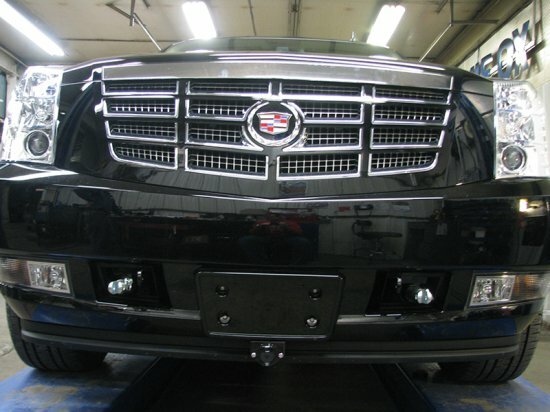 Safety cables are always included in our Blue Ox tow bar packages at no additional cost. To ensure safe towing, verify that the weight of your vehicle is under the maximum rating of the tow bar you select. The Blue Ox Alpha is a classic Blue Ox tow bar with a 6,500 lb. towing capacity. Made of steel, this entry level tow bar has standard latches with a great combination of affordability and performance. Don't get into a bind! The Ascent is a next generation tow bar from Blue Ox. The tow bar is 2 inches longer than the classic Blue Ox tow bars which improves your turning radius, reducing the risk of binding. It also has low profile non-binding latches which enable you to unbind a bound tow bar by hand! No more special tools, brute force or maneuvering of the dinghy vehicle. Additionally, this aluminum tow bar is only 31 lbs. and will not rust. The Ascent has 7,500 lb. towing capacity. The Blue Ox Avail is the king of the tow bar mountain! With a 10,000 lb. towing capacity, you can tow vehicles big and small. Like its little brother the Ascent, the Avail incorporates next generation Blue Ox technology including non-binding latches and is also 2" longer. Your accessory kit includes the taillight wiring, electrical cable, and other components like tow bar covers, locks, electrical cables, etc. All kits come with the 7-way RV connector to 6-way round cable that is standard to most RV plugs. If your RV does not have the 7-pin RV blade style connector, contact us and we can substitute a different cable. The diode kit allows you to use your existing turn and stop bulbs while isolating the vehicle's system from the RV. Includes diodes, vehicle wiring/plug, and 7 to 6 wire electrical cable. The bulb in socket kit allows you to have a separate set of bulbs in your tow vehicle to provide complete electrical isolation from the RV. This system requires holes to be drilled in the back of your taillight assemblies to accept the bulbs. Includes bulb kit, vehicle wiring/plug, and 7 to 6 wire electrical cable. This fully featured Alpha tow bar combo kit includes both the diode and bulb and socket wiring configurations, a tow bar cover, baseplate locks, a receiver lock, a 7 to 6 way electrical cable, and the female connector and wiring for the tow vehicle. Not compatible with the Ascent or Avail. The same deluxe towing kit as described above, but designed for the Avail tow bar. Choose this one if you're buying an Ascent tow bar with your package. The same deluxe towing kit as described above, but designed for the Avail tow bar. Choose this one if you're buying an Avail tow bar with your package. Most state\'s laws require vehicle braking systems for vehicles over 3,000lbs. Below we offer our most popular models depending on your application. Feel free to call us if you have questions. Our most popular portable braking system. This brake can be moved from vehicle to vehicle and meets all state requirements. Offering true proportional control, this is the easiest and most cost effective brake we offer. Designed for coaches with hydraulic braking systems, the SMI Delta Force is installed in your tow vehicle. It offers easy connection, fast performance, and is our most popular model for this application. Our top-of-the-line installed brake for coaches with air brakes. This system offers immediate braking, full integration in your tow vehicle, and easy connection.